‘The Help Me With’ section is the final key component to completing your project. At this point, it’s important to detail the things you need further help with. Be sure to break out each item by line. This section is an opportunity to highlight any design needs that you may have. You may want to use this section if you just have a sketch and now need a designer to construct a techpack for you. You may also need this section if you have a sketch and techpack but are now in need of a pattern or sample maker. 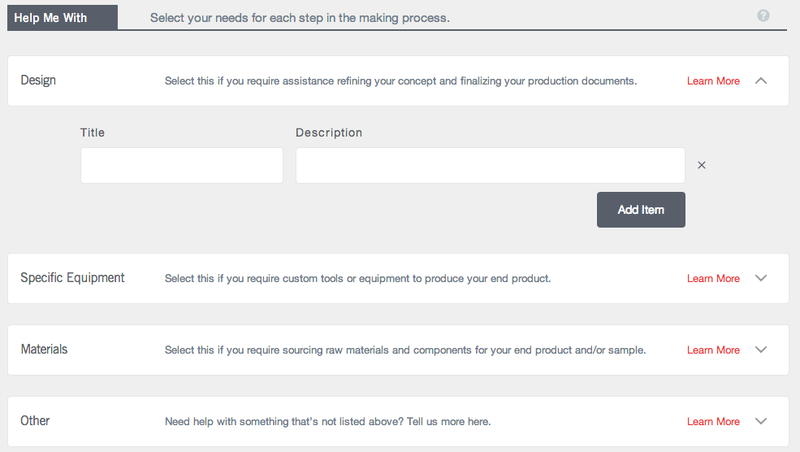 This section is an opportunity for you to detail any ‘specific equipment’ that you may need for your project. It’s fine if you aren’t sure what equipment you may need. If you aren’t sure, you may want to research the materials you are using and their construction. Special considerations should be made with leather and certain stitching patterns. This section is an opportunity to highlight any material needs that you may have. Be sure to break out each material line by line. Name each material and describe in detail what you need. The description should include details about the finish, color, and treatment. Anything else that doesn’t fit into the other buckets throw into this section. For this section in particular, you can insert help items related teckpacks, images or anything else in particular. Using Projects to Source Manufacturers.